Jeanne Vodicka, RN BSN. Graduated from UNC-Chapel Hill 2010. 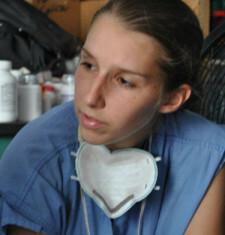 Lived in Haiti and volunteered with Ti Kay Haiti, Inc July 2010-November 2011. Currently works in a Surgical Trauma Intensive Care Unit and plans to continue to travel and help those in need. She would like her patients to always remember: Meds, Manje, Manba! !